Anyone who has ever put together a road trip playlist knows the simple joys of site-specific songs to trace your route. Is it possible to drive through wide swaths of Illinois without a Sufjan Stevens song or two running through your brain? Or to head south to Louisiana without Lucinda Williams' Car Wheels on a Gravel Road to keep you company? Matt Harnish and Rob Severson have no shortage of songs about cities, states and towns in their respective libraries, but for their upcoming joint tour, the two musicians did one better: They joined forces for a ten-song EP of covers documenting some of the stops on their 24-date jaunt along the West Coast. It's a travelogue in song, with their home-recorded versions of the Mountain Goats' "California" and Perry Como's "Seattle" lighting the way. 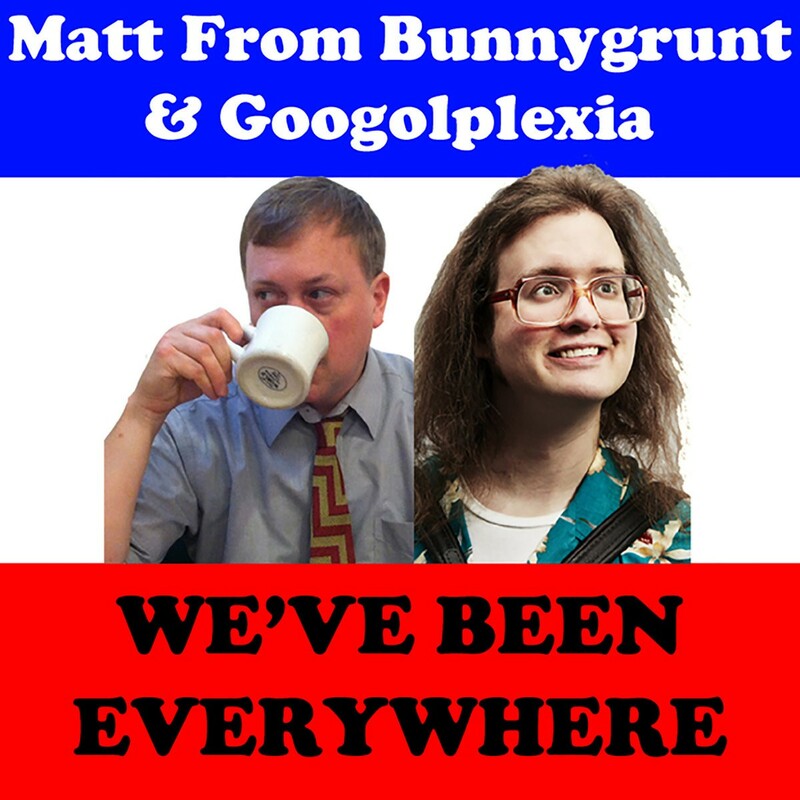 Matt Harnish is best known as the co-leader of the long-running Bunnygrunt; Severson performs as the one-man band Googolplexia. This won't be the first time these two have toured together — a twelve-date run last year introduced East Coast listeners to these St. Louis oddballs. Severson had done brief stints as a roadie and driver on previous Bunnygrunt tours, but the 2016 outing allowed Harnish to see Severson's Googolplexia act in a new light. "Seeing him play for a room full of strangers for the first time was really eye-opening, because I knew him as Rob, the goofy guy who is great and fun," recalls Harnish. "But seeing him work a crowd of people he doesn't know is really impressive." Severson's act — a mix of accordion, ukulele and banjo alongside a Janet Jackson/Garth Brooks-style headset microphone — is a performance in every sense of the word. While local audiences have seen Googolplexia in a variety of venues across town for years, Harnish recalls watching those out-of-town shows with slight trepidation. In the end, Severson's stagecraft and persona won the crowd over. "There's this arc of him confusing people, into him kind of amusing people, into him getting people totally on his side," Harnish says. "Then it's a done deal — he has them for the rest of the show." While the pair have shared the stage, March (to Certain Doom) marks the first time they've recorded together. The EP, brief as it is, combines each musician's powers — Harnish's hook-heavy pop smarts and Severson's fearless, full-bodied approach. A number of these songs have been truncated down to their core; the blues standard "Rock Island Line" is over in under fifteen seconds. Others stretch out into the ether: A swirling, circular arrangement of John Denver's "Rocky Mountain High" never moves off the song's chorus, but it some achieves a minor state of hypnosis thanks for Harnish's flanger-effected guitar and Severson's multi-tracked, octave-spanning vocals, which become more and more unhinged with each pass. Severson brings a similarly demented presence to the pair's take on the Walker, Texas Ranger theme song. A longtime fixture at Vintage Vinyl, Harnish takes a crate-digger's approach to the songs he brought to the project. 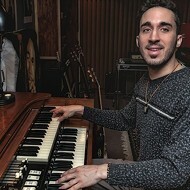 He channeled some of the Osmonds' glee-club innocence in his cover of that family band's song "Utah," though the final version contained a little more pomp and stomp. "'Utah' came out totally different than I thought it was going to, because it's a super psychedelic-bubblegum kind of thing," says Harnish. "When I recorded it and when I sang it, it sounded more T. Rex than Gary Glitter. I don't know why that happened, but it did." The gem of the set, at least for longtime St. Louis music fans, is the opening track, a brief cover of the Lydia's Trumpet song "Iowa." Ray Kirsch led that band through various psych, pop and folk phases in the mid-'90s, and though Kirsch left St. Louis, his band members have gone on to play in bands such as Karate Bikini, Swing Set and Prune. "That was the first song that occurred to me," Harnish says. "That's one I probably will do on the tour 'cause that's one I can pull off with me and the guitar. That song was kind of the impetus for even doing the 'songs about where we're going' tour CD." While the upcoming tour will showcase Harnish and Severson playing in a variety of venues — rock clubs, DIY spaces, an art gallery — the trip also serves as a reunion for Harnish's main squeeze, Bunnygrunt. 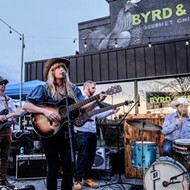 Co-founder Karen Ried left St. Louis in 2013, first landing in Cincinnati and now residing in Portland, Oregon, so the band has been on two-year hiatus. That spell will be broken for four dates in the Pacific Northwest; even drummer Eric Von Damage is flying in. Those shows will be a return to normalcy for Harnish, though he seems to relish the infinite variety of tour life, no matter who is in the van alongside him. "I don't know how to not do it," Harnish says of touring. "I'm taking months and months off in between shows, but once I do it, it all makes sense again. With the last tour we did, last May, it was great — it was all the living I want to do. It's the sleeping on floors and eating at weird places, meeting strange people and staying up too late." 8 p.m. Thursday, March 9. The Schlafly Tap Room, 2100 Locust Street. Free. 314-241-2337.